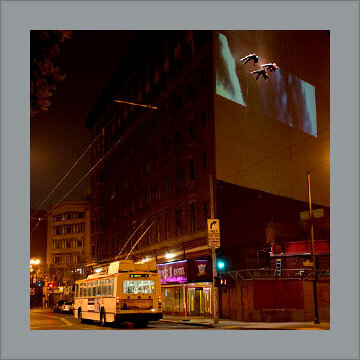 We perform off the ground, with dancers suspended anywhere from 2 feet to 100 feet above the street. 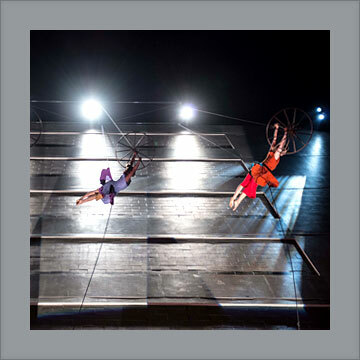 Flyaway creates a sense of spectacle that makes a lasting impression with an audience, striving for the right balance of awe, provocation, and daring. We dance at the intersection of social justice and acrobatic spectacle, exposing the range and power of female physicality. 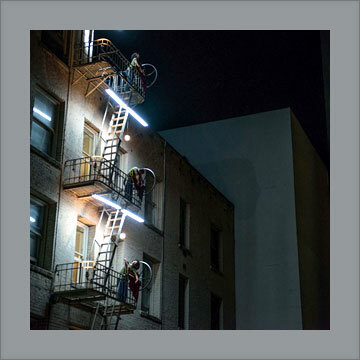 Described by the SF Chronicle as "intimidatingly creative," Jo Kreiter embraces community-responsive collaboration, a masterful use of place, an intersectional feminist lens and a body-based push against the constraints of gravity. Flyaway has developed a nationally recognized expertise in creating site-specific performance work. 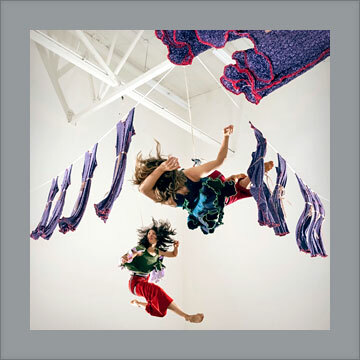 Since 1996, the company has presented numerous large scale works, including the award winning Niagara Falling (2012), Multiple Mary and Invisible Jane (2014), about older homeless women, and Needles to Thread (2015), created for and within of the city’s most blighted urban alleys. Kreiter/Flyaway is a recipient of a Rauschenberg Artist as Activist Fellowship, an NDP award, four Isadora Duncan Dance Awards, as well as awards from the Center for Cultural Innovation, New Music USA, the Artist Investigator Project of the California Shakespeare Company, CHIME, the NEA, CA Arts Council, Creative Work Fund, Meet the Composer, MAP, the Wattis, Rainin and Gerbode Foundations, and the SF Arts Commission. Her articles have been published in Aerial Dance, Contact Quarterly, In Dance, STREET ART San Francisco, and Site Dance — the first book written on contemporary site specific performance. In the 2015 book, "Moving Sites: Investigating Site-Specific Dance Performances", Kreiter is profiled for creating "the politically-driven work of the experienced and prolific site dance artist." Jo Kreiter has returned with a new excursion into the ether, a practice in which she has few, if any, rivals hereabouts. This is art at the heart of the democratic ideal. As the performers send stomachs fluttering while they zip up and down the wall (they’re harnessed, but the sense of danger remains), you realize the extent to which site-specific dance art has come of age.